Of the thousands of improvising musicians in New York, there are untold legions of gifted players who have scarcely been recognized. Ursel Schlicht should be counted among them. Her relative obscurity is partly self-imposed, as she seems uninterested in plopping herself comfortingly in a single marketable style, but the “industry” and its attendant (or co-dependent?) slothful behavior of mainstream listeners are at least equally culpable. Never mind: Schlicht displays not a jot of concern for this condition, showing up cheerfully for gigs with a warm smile and giving of her talent with generous abandon. Comparisons are slippery, but if Keith Jarrett had remained unknown and had veered decidedly toward a more atonal style, his career might have resembled Schlicht’s. So far, that is. Schlicht is not widely available on recordings (it’s a safe bet there’s no partition with her name on it to be found at Tower), but one thing is certain: she has issued a wonderfully listenable, yet daringly exploratory disc with guitarist Bruce Arnold (who also contributes electronic sounds with something called a supercollider). The session sounds like an effort to seek every corner of modern musical expression without ever resorting to comfortable pop forms. While Arnold coaxes techno sounds from his supercollider, Schlicht, who is a fine jazz pianist with strong modern classical overtones in her improvising, cannily deploys prepared piano, with which she interjects percussive and textural counterpoint. These are some of the record’s best moments, and part of the fun is trying to tell who’s making which sounds and how. Arnold, by the sound of it, has solid jazz technique, but when he attempts to improvise melodic counterpoint with Schlicht (an extremely difficult challenge) the result is sometimes less graceful, perhaps owing to the pianist’s pronounced atonality. Here, the duo’s stylistic differences may not quite mesh flawlessly, but elsewhere they find perfect union, as on the concluding three-part suite, in which all of the duo’s ideas and techniques seem to gel and flourish in a cohesive dialogue. Most freely improvised and/or experimental music is impossible to recommend to general audiences without dire warnings. String Theory is definitely not for every jazz lover—what is?—but for sophisticated and open-minded listeners, it’s highly enjoyable music that invites repeated plays. 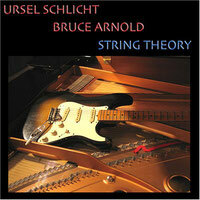 This the third duo disc that Ursel Schlicht left us with this week. This one features Ursel on piano & prepared piano and Bruce Arnold on guitar & supercollider. Guitarist Bruce Arnold has a dozen discs out on the Muse Eek label, which I would imagine he runs. Bruce plays electric guitar through a variety of devices and sounds like a gifted improviser. He is a perfect match for Ms Schlicht who also plays a variety of strange sounds by manipulated the strings inside the piano with different objects. While Bruce creates strange electronic dreamscapes, Ursel's piano almost sounds "normal" by comparison. On "SpaceTime", Bruce plays more jazz-like lines as Ursel weaves neatly around him until he starts to insert that eerie electronic punctuation. There is an unexpected melancholy segment midway through the is piece, that is a nice departure, until they increase the tempo and things get a bit weird once more. What's interesting is that Ursel sounds completely different here, playing a lot less inside the piano and sometimes keeping the vibes closer to the planet earth than Bruce's spaced-out guitar sounds. Next stop Mars and please don't open that door, you don't want someone to fall out, do you?!? © Ursel Schlicht 2019. All rights reserved.